Just think about the above statistics for a second from Wikipedia. The U.S. is the largest economy on the planet with roughly $18 trillion in current GDP and about 320 million people. China is the second largest economy with roughly $12 trillion in GDP and has about 1.5billion people. 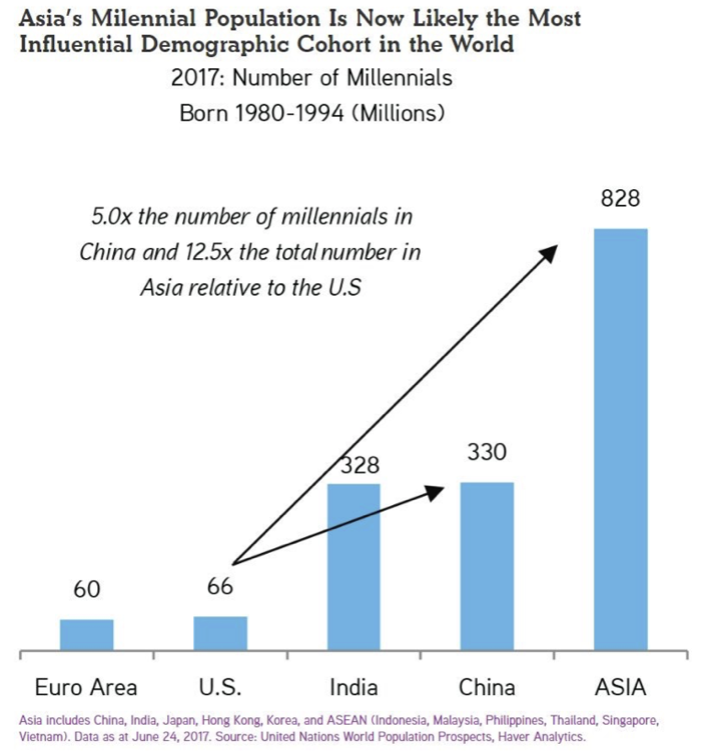 Asia in aggregate has about 4.5billion people so the clear opportunity for consumer companies is to target the future growth of the Asian region. Every single U.S. brand we focus on has a keen interest in building brand loyalty from Asian consumers. The median age is 30.7 vs the U.S. at 37 years so in theory companies that cater to the habits of younger consumers have a very attractive run-way for growth. And we know young people consumer using technology and are mobile focused, particularly Asian consumers. Nothing is more predictable than a consumer’s propensity to spend. Spending is not a uniquely American phenomenon and I could argue strongly that the consumer spending component of U.S. GDP will not expand much from current levels (70% of GDP). I doubt the 70% contracts but growth from here gets harder. The real growth in consumer spending as a percent of GDP should come from countries like China, India, and other Asian economies. The companies that are well positioned with these consumers should be able to ride a monster wave for many decades. What’s drives spending patterns? The answer is the same no matter where you live: Brand loyalty. Global brands spend billions of dollars each year marketing and advertising to consumers. As a brand grows bigger and more relevant, so too does its cash flows and revenues. The economic moat gets stronger and stronger, the noose around competitor’s necks, gets tighter and tighter. Within consumer spending, the real growth is coming from E-Commerce.Many of these Brands are not household names in the U.S. but they are the Chinese equivalents to Amazon, Netflix, Facebook, Apple, Google, Expedia, etc. If you haven’t heard of the Chinese and emerging market brands, it’s only a matter of time. Here’s the good news: with global growth slowing, currencies falling, stock markets correcting, many of these marquee consumer brands have already experience large pull-backs that are attractive for long-term investors. As China in particular continues to shift away from a manufacturing base to a consumer-led, domestic consumption focus, these brands will gain more sales, cash flow, and mind-share. Video games and mobile payments are an enormous growth engine across Asia with the leaders below. Owns ~80% of the online sales in China. Asset-light model within e-commerce but expanding their brick-n-mortar presence. Alibaba Group Holding Limited, through its subsidiaries, operates as an online and mobile commerce company in the People's Republic of China and internationally. The company operates in four segments: Core Commerce, Cloud Computing, Digital Media and Entertainment, and Innovation Initiatives and Others. It operates Taobao Marketplace, a mobile commerce destination; Tmall, a third-party platform for brands and retailers; Rural Taobao program that enables rural residents and businesses to sell agricultural products to urban consumers; Juhuasuan, a sales and marketing platform for flash sales; Alibaba.com, an online wholesale marketplace; Alitrip, an online travel booking platform; 1688.com, an online wholesale marketplace; AliExpress, a consumer marketplace; and Hema, a proprietary grocery retail format. The company also provides pay-for-performance and display marketing services through its Alimama marketing technology platform; and Taobao Ad Network and Exchange, a real-time bidding online marketing exchange in China. In addition, it offers cloud computing services, including elastic computing, database, storage and content delivery network, large scale computing, security, and management and application services, as well as big data analytics and a machine learning platform through its Alibaba Cloud Computing platform; Web hosting and domain name registration services; and payment and escrow services, as well as develops and operates mobile Web browsers. The company provides its solutions primarily for businesses. Alibaba Group Holding Limited has strategic collaborations with Driscoll's and Thai Union/Chicken of the Sea to launch their food products to China; and a collaboration agreement with The Hong Kong Polytechnic University. The company was founded in 1999 and is based in Hangzhou, the People's Republic of China. Focus: Online retail and owns its fulfillment facilities offering an attractive economic moat. Has significant e-commerce partnerships with other Chinese internet companies. Walmart owns ~10% of JD in a deal they did to acquire the online grocery business from Walmart. JD.com, Inc., through its subsidiaries, operates as an e-commerce company and retail infrastructure service provider in the People's Republic of China. It operates in two segments, JD Mall and New Businesses. The company offers home appliances; mobile handsets and other digital products; desktop, laptop, and other computers, as well as printers and other office equipment; furniture and household goods; apparel; cosmetics, personal care items, and pet products; women's shoes, bags, jewelry, and luxury goods; men's shoes, sports gears, and fitness equipment; automobiles and accessories; mother and childcare products, toys, and instruments; and food, beverage, and fresh produce. It also provides gifts, flowers, and plants; nutritional supplements; books, e-books, music, movie, and other media products; and virtual goods, such as online travel agency, attraction tickets, and prepaid phone and game cards, as well as consumer electronic products. In addition, the company offers an online marketplace for third-party sellers to sell products to customers; and transaction processing and billing, value-added fulfillment, and other services. Further, it provides online marketing services for suppliers, merchants, and other partners; logistics services for various industries; consumer financing services to individual customers; and supply chain financing services to suppliers and merchants. Additionally, the company offers online-to-offline solutions for customers and offline retailers, as well as online and in-person payment options and customer services. JD.com, Inc. offers its products through its Website jd.com and mobile apps, as well as directly to customers. As of December 31, 2017, JD.com, Inc. operated 7 fulfillment centers and 486 warehouses in 78 cities covering various counties and districts. The company has strategic cooperation agreement with Tencent Holdings Limited and Vipshop Holdings Ltd. JD.com, Inc. is headquartered in Beijing, China. Formerly the largest company in China by market cap and ~$150B in market cap destroyed over the last 4 months. Key leader in social networking and mobile payments via We-Chat app. We chat has over $1B daily users and has rapidly become the go-to app for messaging and paying for everything a consumer wants. Strong video gaming presence and hold ownership stakes in Fortnite’s parent Epic Games as well as in Activison. Also holds a ~5% stake in Tesla. Tencent Holdings Limited, an investment holding company, provides Internet value-added services (VAS) and online advertising services in Mainland China, Hong Kong, North America, Europe, other Asian countries, and internationally. The company operates through VAS, Online Advertising, and Others segments. It offers online games, community VAS, and applications across various online platforms; online advertising services, such as delivery of pay-for-click, pay-for-download, etc., as well as display based advertising; and payment related, cloud, and other services for individual and corporate users. The company also develops software; develops and operates online games; and provides information technology, asset management, online literature, and online music entertainment services. Tencent Holdings Limited was founded in 1998 and is headquartered in Shenzhen, the People's Republic of China.